It's quite common to be 'blinded' when you view a car - it's a common thing (or so I've read) in Psychology to be overwhelmed by all the visual stimulae of something new - your brain is so busy taking in this unfamiliar thing you're looking at, that you won't spot the detail.... unless you know what to look for. Don't necessarily be put off by the signs of some repairs - but be wear of the quality. 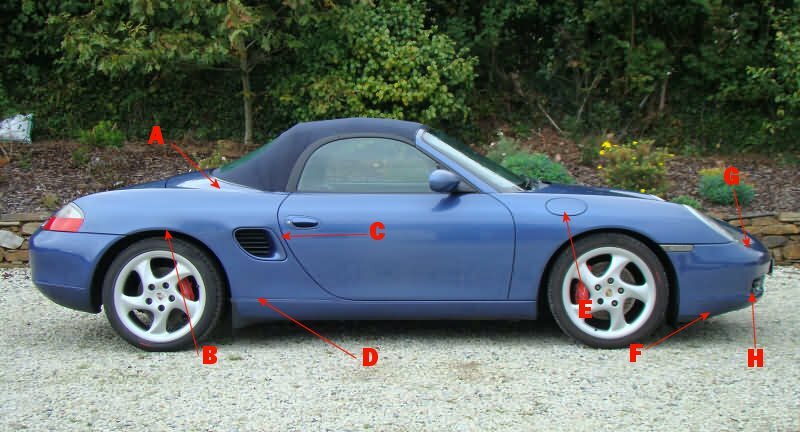 It's absolutely normal to expect that a Boxster has had some paint repair in it's life - scrapes happen, stone chips happen. You do need to be aware of the quality of any repair, though, and be sure that you can work with what is there. Remember - It's absolutely value-for-money to pay for a finance/accident/mileage check, like a HPI report or similar, prior to buying. Do your research, as per the first post, prior to viewing. There is nothing wrong with buying a previously damaged car so long as you know what you are buying. A If the rear, or rear quarter has been previously sprayed, check in the shut lines for the hood. The worst paint jobs are normally the laziest, so you might be able to see signs of overspray in this area. Re-using the picture from above, you'll see an area you could check. 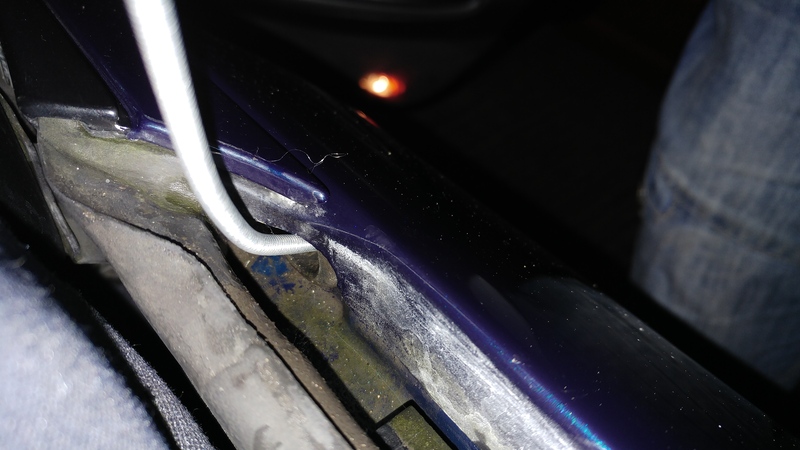 The white stuff, in this instance, was excess polishing compound from when I machine polished the rear wing - this could easily be primer or paint, so be sure to check for anything like this. It's useful to have a damp cloth on hand to wipe away any dirt/dry polish. 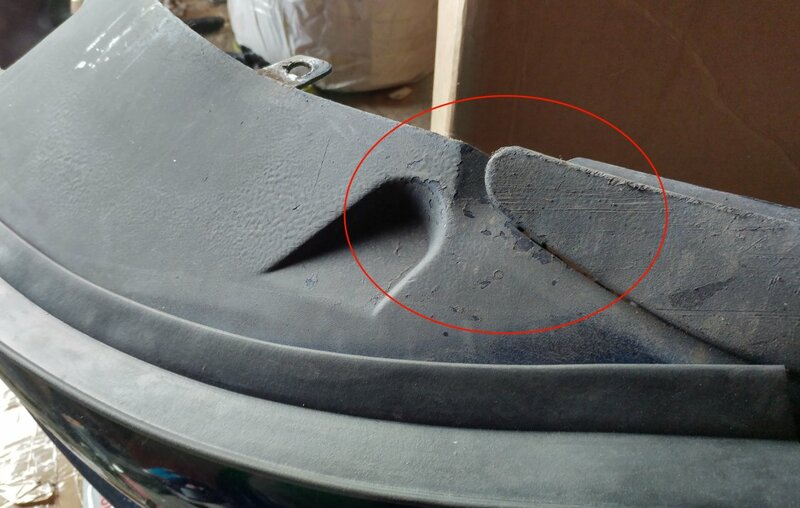 B Similarly, check the arch liners/shock absorber/spring for signs of overspray. Not many bodyshops will remove or mask this whole area, so it can be easy to spot any excess paint that has made its way in this area, if it has had repairs/paint. C The grilles on the rear quarter are also an area to check. They can be a pain to remove, if you don't know how to do so, which means that it's an area that will be ripe for tide marks/runs/lacquer peel (from poor prep in this area). A good paint job, or unpainted grille, should look faultless. 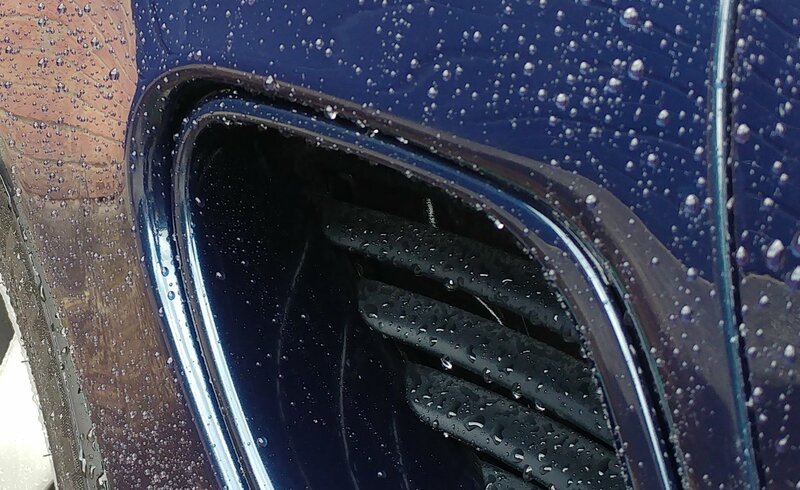 A pre-facelift 986 should also have black plastic grill fins - some people like to paint these body-coloured, but it could also be a sign of a lazy paint job. If you can see in the engine bay, there's a chance that bad overspray (if these are painted) could have made it's way through. D When a panel is painted, a painter (or smart repairer) will normally look for a place to hide a 'blend line'. This is a point where the paint can stop without leaving a noticeable line for where it has been blended. A common area for this is the swage line on the sill. Check that there are no signs of broken lacquer, steps or other joins hidden in this area. Again, it's not an issue if there is, as some paint is normal, but signs of paint repair on the rear quarters may prompt further questions. E & G The front wings are removable, but check again in the recessed areas for 'dry' (i.e. not smooth and/or reflective) paint, overspray etc. The wings themselves are bolted along the bonnet shut lines with torx headed bolts. These are practically made of cheese, making it hard to remove them without chipping the paint or damaging the head. Check these are still present, painted body colour and with no signs of tampering (else, ask questions/make further checks). I replaced my wing with a good used spare due to marks and scraches - sometimes it's far more economical (and better, long term) to get a factory-painted used panel in good condition, than have the existing one repaired/repainted. Again, it's not unusual for these to be removed and re-painted - when an owner puts protective grilles (like the Zunsport ones) on, for example. It is purely something you can be aware of, which prompts for a further look. Another quick check would be the number plates. Around September 2001 (for the 'new' style registration prefix), it became a requirement for new number plates to display the supplier, post code and BSAU 145d. This isn't actually a perfect system, as people still use non-standard plates, but where correct it can help to show some history. Firstly, check the supplier at the bottom of the plate. In theory, if a car is supposed to have been OPC serviced it's whole lift, you might expect this to be reflected on the plate. It's certainly a good sign (of sorts) if the plates front and rear look to be the originals (from when the car was new). You definitely don't want them to be marked in such a way that suggests they came from a bodyshop/accident repairer, again without asking further questions or perhaps expecting it. Whilst many people (including myself) see fresh plates as a cheap way to 'lift' the look of the car (nothing worse than old, faded or cracked sets), many non-enthusiast drivers will overlook them, replacing them only when necessary. You would, therefore, perhaps be able to see this in an MOT history check, where they were an advisory or fail point. 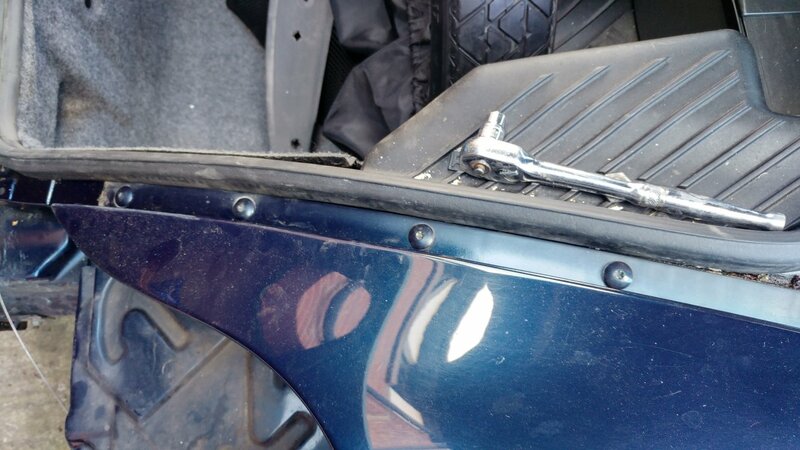 They are often the first thing to be damaged in the event of an accident, so non-matching plates (or even cracked plates) should draw your attention. Orange peel can be normal - it is traditionally though of as being the result of poor paint handling - sometimes through laying paint on too heavily, or by incorrect paint flow (gun) setup. Due to modern manufacturing methods, it's thought of as completely normal to see some degree of orange peel on a brand new car (even more so, as time goes by). Not as much as in the picture above, mind. Each manufacturer will have it's own level of quality when it comes to orange peel, but it would at least be consistent over the whole car - if one panel stands out as being different that the next, it could mean that is has seen some work before. Here's an extreme example - this is acrylic aerosol lacquer from the can, showing bad orange peel. Notice how the paint looks 'drier' (as mentioned earlier) as the new paint fades out. Another area not to overlook (especially on metallics and pearlescents) is the paint depth. The paint on a modern car is mostly made up of several layers. Beyond the protective initial coats (for priming, weatherproofing and guarding against corrosion), you will have a base coat (above as "color coat") and a clear coat. 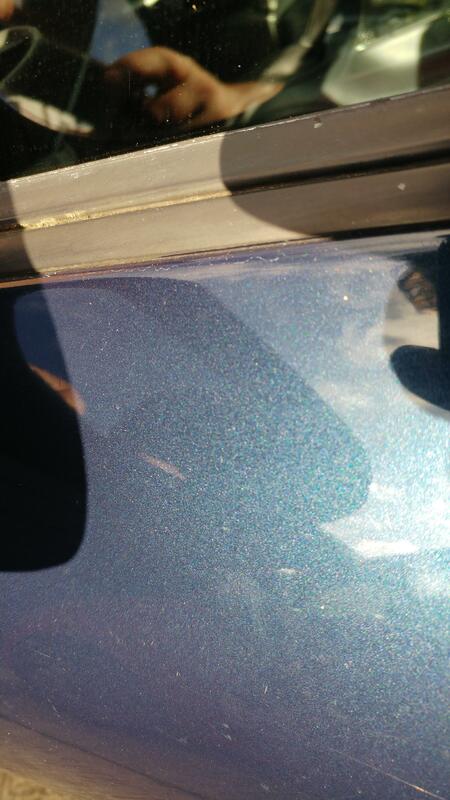 The base coat will consist of the colour of the vehicle, with metallic flakes in for non-solid colours. This is then finished with several layers of "clear coat", or "lacquer". Paint comes in different mediums, from water-based (air dry) modern tree-hugging varieties (which can include spray cans), to 2k paints (which consist of two parts - the paint, and a hardener which usually contains isocyanate). The latter is more durable and tougher paint, but there are more stricter controls over the availability of it, and how you are supposed to spray it. 2K paints are hazardous (due to the ISO content), so outside of a spray booth you'd expect 1K (air dry) paint to be used. Why does this matter? 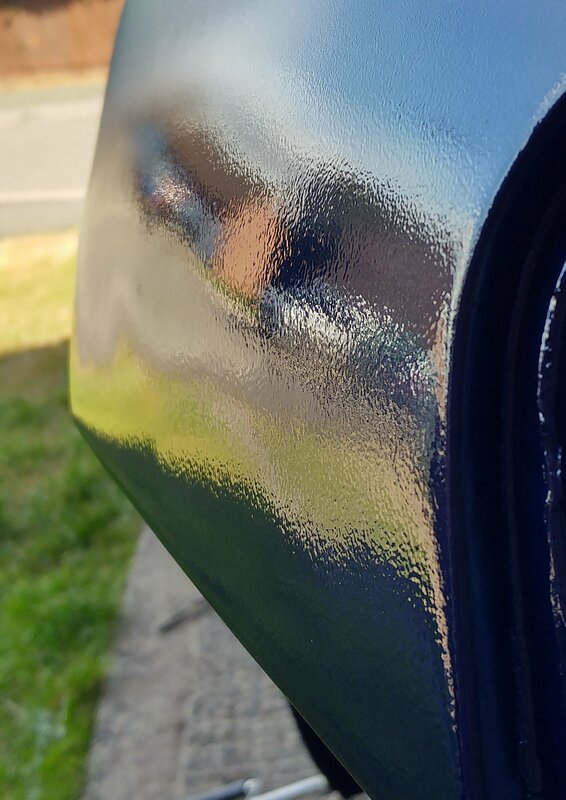 Well, it means that a cheaper paint job (or one done by a smart repairer outside), will often have a thinner or less durable clear coat. This can represent itself by a 'shallow' finish on metallics. You should not only notice the slight 'peeling' of the clear coat near the window seal, but also the speckled appearance of the metal flakes. This should only really be seen on very clean paint and/or in direct sunlight. The quality of the paint depth has a direct impact on it's appearance, and can appear to be duller and lighter. The panel in the picture above should be the same colour as that of the other photos. It's not a trick of the lighting or angle - you'll see that it looks far too metallic, and has no depth. Look down the body. 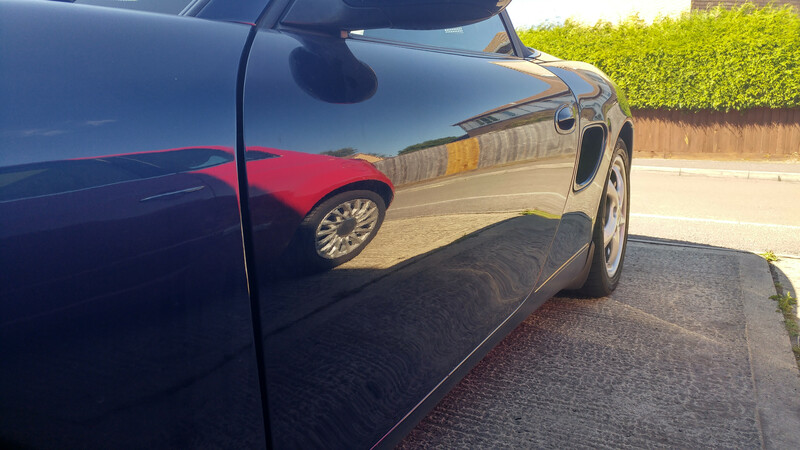 By looking down the length of the side of the car, any dings or paint issues should be prominent. 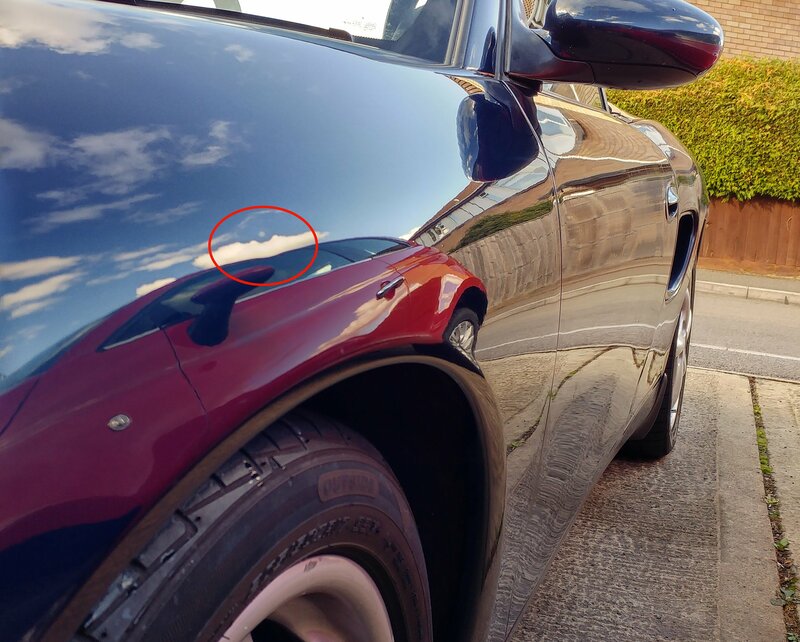 You can also use a reference point in the reflection, something straight, to see if there are any distortions in the paintwork. 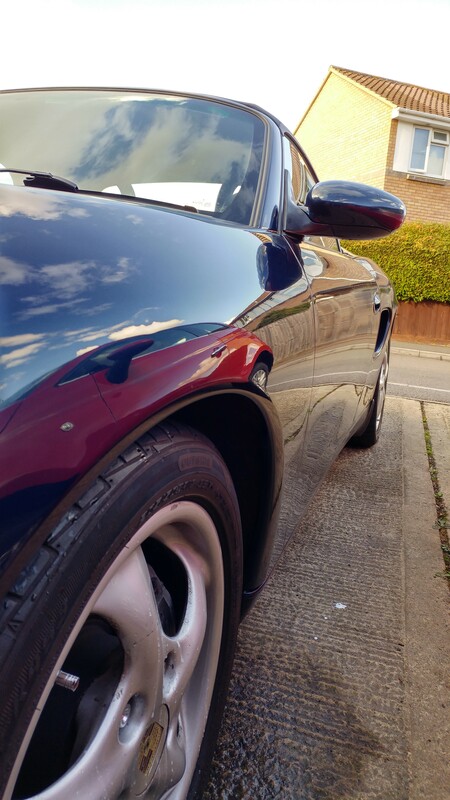 Any bubbling, or rust, on the bodywork isn't a good sign either - Boxsters don't do this unless there's something bad hiding underneath, like bodyfiller and/or accident damage. This isn't a detailed and thorough guide - there are a lot more things to look out for - but I hope it will help you to notice things that you might otherwise miss. Porsche had a very thorough paint process from the factory, so you should expect better paint than that of a cheaper car - bear this in mind when inspecting; a little 'orange peel' is normal, but you should expect the paint (if original) to be of good quality. Apologies if I upset/annoy anyone with this - I'm not a bodywork expert and any older car will have some signs of cosmetic repair, so don't use any of this as a reason to discount a car - just weigh it up alongside the rest of my advice, and the price you want to pay. 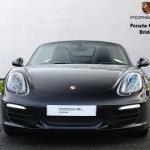 As a newbie, looking to buy a Boxster, I found this guide excellent. I am still digesting !!! My Ride:2011 BMW 520d F11 (Touring), 2007 Mondeo ST TDCI Estate, Porsche Boxster 986 (2000) 2.7 in Arena Red, Black Porsche 944 (87) with 3.0 S2 engine upgrade, Turbo brakes and PU front. Overwhelming guide and some serious food for thought. Also looking and it's definitely better to be warned than to fall foul. A lot to to digest. This guide really helped me evaluate my recent purchase and decide to proceed. Thank you for taking the time OP - much appreciated. Location:London, Norwich and Sheffield ...I get around! I'm about to view my first 986 in a few hours time so this was super-useful. I'm looking for a 'daily' and a full on project car (biiiig project.) For the daily, the 2003 cars with upgraded engine specs and the glass panel in the roof as standard are worth looking for me. For the project, I'm leaning to the pre-2001 2.7 or possibly S. Different strokes - I won't need the interior or the roof, and the ability to almost completely reconfigure the exhaust without any IVA worries will be a good thing. 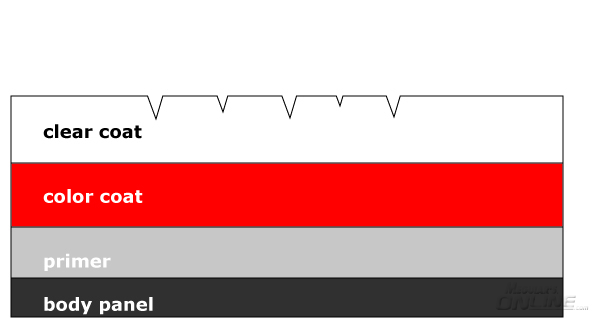 Since the end result should be very light indeed, engine power output is less of a worry for performance. 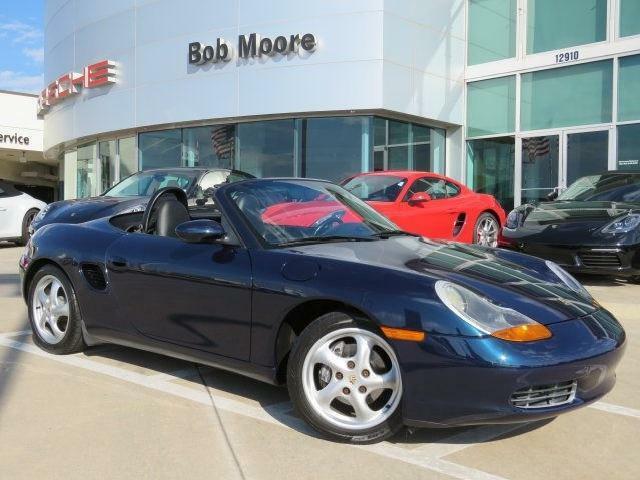 I wish i had read this before I bought my Boxster would have saved me a lot of wasted time, great guide for the novice and experienced buyer.